Take another look at Rudolph. His story remains the same, written in 1939 by Robert L. May. Each generation has its own favorite edition. This is the newest, and one of the most beautiful I’ve seen. 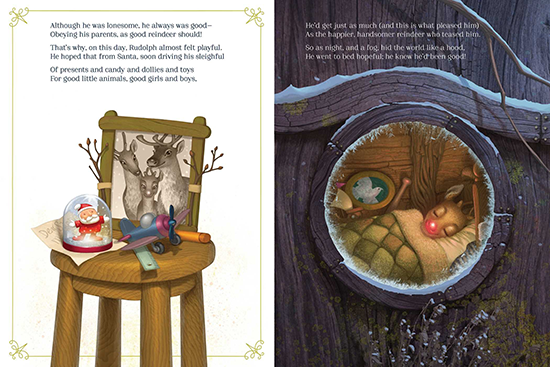 Illustrated by Antonio Javier Caparo, this book immediately draws in the reader with its paintings. The richness of the scenery and the child-like qualities of the characters play opposite each other to create a beautiful and yet whimsical place in time. 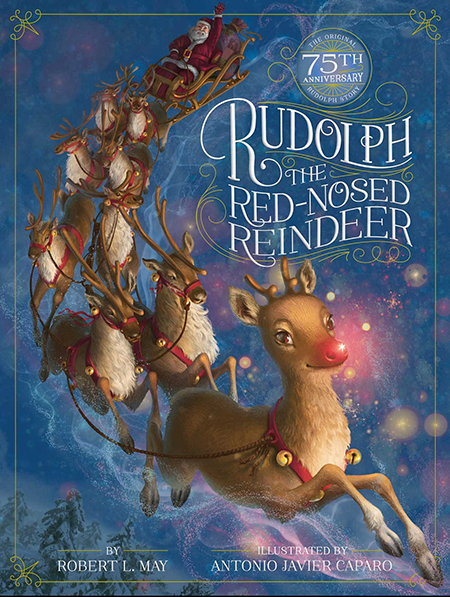 As the story goes, Rudolph is excluded from the rest of the herd because of his shiny red nose. But he was always good and kind, and went to bed on Christmas Eve hopeful that Santa would visit and leave him candy and toys. 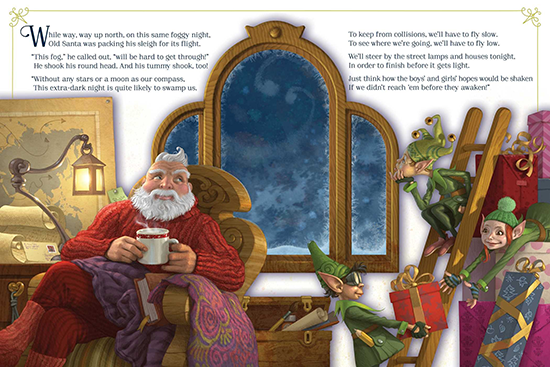 While up at the North Pole, Santa is worried about the foggy night ahead. 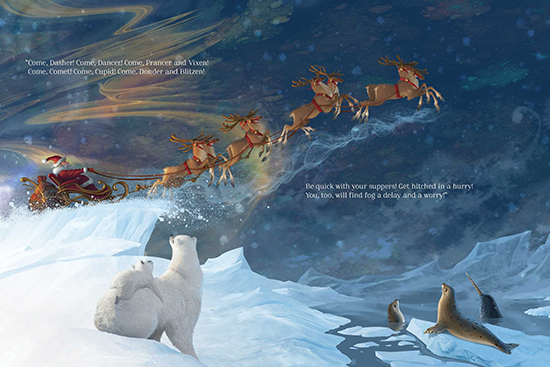 The illustration of Santa leaving the North Pole, flying over the polar bears, seals, and norwhal, is gorgeous. The fog is so bad, Santa barely missed a speeding plane. And when he lands, he can hardly see the street signs and house numbers. 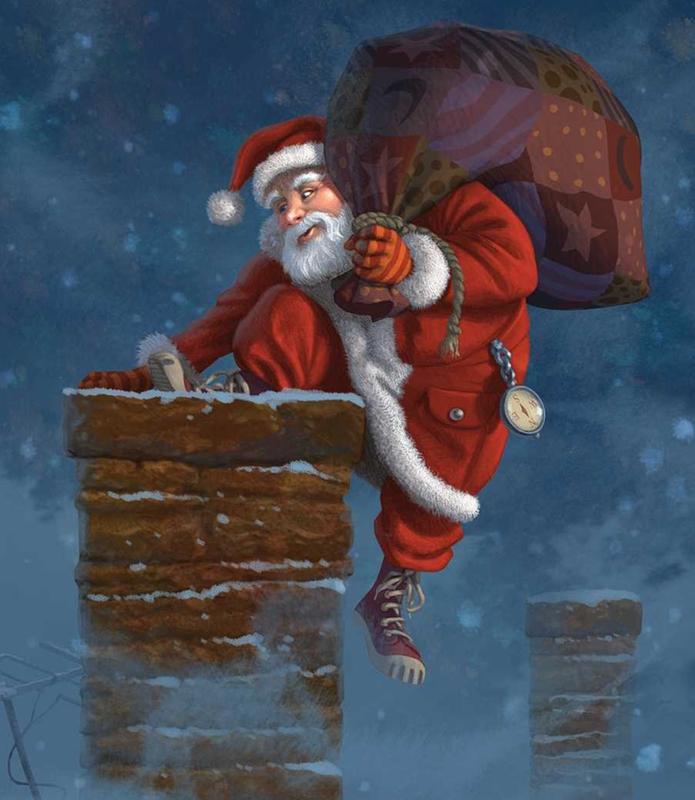 Santa finally makes his way to Rudolph’s house and climbs down his chimney. And, as they say the rest is history! Santa sees the glow from Rudolph’s red nose and asks Rudolph to guide his sleigh. All the presents got delivered in time and the next morning, Rudolph returns home, the envy of all the other reindeer. He proudly lands Santa sleigh in the field and everyone watches on as Santa appoints Rudolph Commander-in-chief. From that year on, whenever the weather is bad, it’s Rudolph Santa calls to guide his sleigh. A gingerbread cookie worried all evening about his fate as Santa’s midnight snack. While he worried about whether or not he would be brave when the time came, two puppies entered the room romping and destroying the decorations. The Gingerbread cookie knew he had to do something, so he made himself a puppy distraction. The puppies stopped what they were doing to watch the gingerbread cookie. Just then, they heard the sound of jingle bells and the puppies hid under the table. Santa saw the huge mess and asked the gingerbread cookie for help cleaning it up. When they were finished, the gingerbread cookie made one last wish. Santa looked down at him and instead of eating him, Santa asked him to be a special helper at the North Pole. For the puppies, Santa left a gift certificate for obedience school. 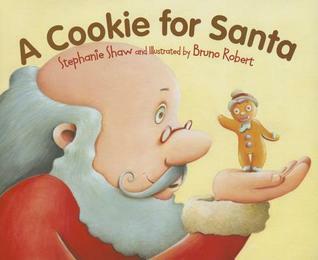 Stephanie Shaw’s story is written in rhyme. 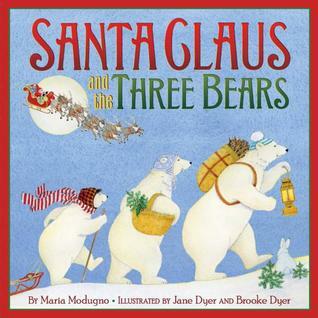 Little ones will enjoy the rhythm and the story of the brave gingerbread cookie who helped Santa on Christmas Eve. Bruno Robert’s illustrations are clean and fresh. The faces of the puppies are adorable, and the gingerbread cookie is so childlike I’m sure kids will identify with him right away. I like this new twist to the ordinary gingerbread cookie. And I like that the gingerbread cookie earns a reward from Santa for his help. 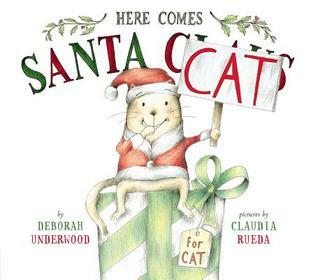 It makes a good read aloud and easy reader for young children.